I remember shortly after my son was diangosed with type 1 diabetes that I was awake as well anyone who has a child that has type 1 diabetes that has zero hypo (low blood sugar awareness) knows that you do not get much sleep. I never watch the news it is too negative and I want our lives to be full of happiness and postive vibes rather than worry. I remember this night there I switch channels and there was American news and I saw this amazing lady Barbara who has set up this amazing charity called www.capes4hereos which made super hero capes for children who had illnesses from terminal illness to long term illness without any cure. I remember just knowing the moment I saw Barbara that I wanted to help. I have never met Barbara however I have this bond with her and know her heart is so pure and filled with so much kindness. I sponsored a number of children to receive super hero capes and each year from the year Harry was diagnosed I send over a number of music and fine art photos in different finishes from metal prints, canvas to mounted prints for Barbara to auction off at their annual fundraising event. This year they are having a year off so items will be sent over ready for June 2018 event. My amazing friend and artist Marvin Blaine who has a profile on here also last year donated some of his amazing art to this charity. As I mentioned during our chat our unit in Cardiff (the only one in the whole of Wales) actually supporter teenagers and young adults aged 13 � 24 during their cancer experience. The unit in Cardiff consists of an inpatients and our patient�s area. (See above pictures) The unit in Cardiff was the first one to offer this. We have 8 beds in the unit which are full at the moment as well as this we see a great number of young people for their check-ups, treatments, therapies and transplants. We fund 2 specialist posts on each of our unit who work alongside a dedicated team of NHS staff to deliver our service here in Wales. Anna Davies, our Youth Support Coordinator works to support the emotional and well-being of the young people we support buy encouraging peer to peer support, 121 sessions, group activities, social tips and treats � even pizza nights (both on and off the unit). Mary Harness is our Lead Nurse on the Cardiff Unit � Teenage Cancer Trust specialist nurses are there to make sure they receive the best care and support once they�ve been diagnosed with cancer. They�ve been specially trained to understand what it�s like to have cancer when you�re young, and will be there alongside them when they�re receiving your cancer treatment. Anyway back to December 2016 and the Red Hot Chili Peppers gig. I had contacted their management before the gig and told them what I was doing. My vision was to get a few photos signed by various artists to auction off for these charities. I also would love for a top photo gallery to exhibit my music photography and sell it with a percentage going to these charities. This I have yet to achieve so if there are any galleries that want me to do this I would jump at the chance. 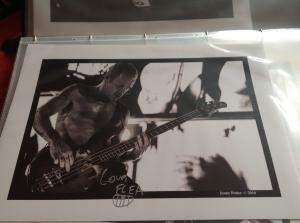 I remember emailing Red Hot Chili Peppers management explaining that I wanted to if possible photograph the band again and if there were able to sign a photo to auction of for these charities great. I then got a lovely surprise saying that this was arranged. On the Saturday before the concert I had a number of my Red Hot Chili Pepper photos printed, I remember rushing with my son Harry, to Cardiff to collect them and also buying a portfolio to put them in. I was not sure what photo to have printed so had a few photos printed ( one was for me as I asked cheekily if Anthony could sign one) and did some personal letters to the band giving my reasons why I was passionate about raising money for these charities. The band's management met us gave us tickets to the gig, and we hung out back stage. My portfolio was taken by their managment Jason and the band were amazing they signed every one of my photos and I am just so thankful and in awe of what Anthony, Chad and Flea did sorry did not have any photos of Josh but will see if he can sign some again. This band are brilliant to photograph are hard working, passionate and deserve all the success in the world. I knew that this festival would be brilliant and it was. I had a photo pass for the 2 days 23rd and 24th July 2016. The last time I photographed here was in 2013 when I had an AAA pass and the headliner was Saxon. That year I had been on the stage with Anvil photographing them. This year the weather was fantastic on the Saturday bringing the crowds in by the thousands. I Arrived at the festival an hour earlier parking in the artists and crew parking and collecting my VIP, Photo pass and weekend band from production. Before the first band BigFoot were on I made sure to pack water, snacks in to my camera bag ready for the day. From the moment BigFoot opened the festival at 12.30 with an energy that would last for the entire festival. From photographing the first band I made friends with a number the photographers Henry Pickelhaupt from Germany who for the entire weekend I kept calling Henry Harry as I honestly thought his name was Harry. Henry was a great laugh and we also hung out with a few other photographer Ray Bannister, Pete Webb from St Ives and Tim and Holly Black from Essential Rock Reviews. www.essentialrockreviess.com . There was also Liz Aiken Blogger and photographer from www.bluesdoodles.com amongst another approximate 12 to 15 other photographers who I recognised and had chats with. 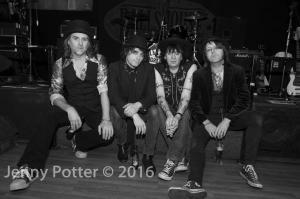 Headlining act for the Saturday was Thunder who I have photographed before and had seen on tour year ago in the 80's. So photographing them is always great and brings back brilliant memories of going to gigs. In between photographing the bands I hung out with the other photographers either in VIP section or near to the stage to listen to the bands and photograph some of the atmosphere. On the Saturday I managed to catch up with "Dirty Thrills" and do a quick photo shoot with them in VIP area and then on the Sunday I had a chat with "last Great Dreamers who were amazing and did a photo shoot with them which was great fun" also had a quick chat to James Toseland from Toseland and had a chat to Marco Mendoza from The Dead Daisies also getting a quick photo thanks to Ray Bannister. Even though there was rain on the Sunday the festival was so buzzing no one cared. The headliner on Sunday was The Darkness who hold a special place in my heart as in 2003 when they were on every cover of every music magazine I had contacted them asking if I could photograph them and they said yes. 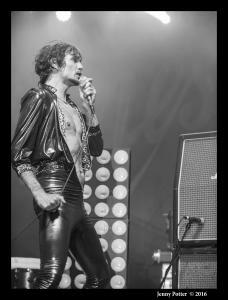 The Darkness was the first music artist I photographed and I am grateful for them giving me a chance as from the first time I press the button on my camera at their gig in 2003 I was hooked and knew that this was what I wanted to do for the rest of my life. So I tend to get a little excited about photographing The Darkness and have to try and not think about it and also not to sing along whilst I am photographing I find very difficult as I just want to sing and dance. I have photographed them 3 times in total now including Steelhouse and every time the band have been incredible giving a fantastic performance which fans and even people who have never ever been to a Darkness gig would find mind blowing. Justin toned the set down a bit as there was a younger audience there and he was so good at performing you really have to go to a gig to see what the band are like as they really know how to put on a great show. Justin was very witty inbetween their set and if you look at utube he did a song singing to a blow up doll which was so funny. I stayed for the set as well there was no way after the first 3 songs no flash (which is what is the norm for if you are photographing an artist) that I was going to head home. So I stood in the audience singing and soaking in the atmosphere. Looking at the man dressed as a banana and all the other fans really enjoying the gig. It was lovely to see so many children at the festival and young muscians (guitarists and drumers) who are the future of music being put on their parents shoulders for the festival and having fun. I met a few of the parents of BigFoot and they were all so very proud. I have so many amazing memories from this festival and can't wait to photographing the next one. I'm thrilled to share with you my latest collection on VIDA! This collection represents some of my best artwork from over the years and is very authentic to who I am as an artist. I'm really proud today to share this work with you. I'm really excited to collaborate with VIDA for this collection. VIDA is a new kind of fashion ecommerce company that connects artists like me all over the world with producers to bring our work to life. For every product sold, VIDA hopes to provide the gift of literacy to the makers they work with. It is a very busy time of the year lots of opportunites to photograph weddings, portrait, model portfolio. Have a busy month with no 2 weeks the same last week designing wedding albums then I photographed HRH the Prince of Wales and HRH Duchess of Cornwall. This week I am busy with wedding albums, have been hired by a few photographers I do weddings and photo shoot for so meeting up shortly for 2 jobs I have been hired to do with them which is great. I am also expanding on the servies I offer as I have done photography work shops at school and I can also be hired one to one for photography advice, support if studying or to show you how to start your photography business. Really excited about all the opportunities that 2013 are bringing. If you work hard you will achieve. Was asked today to photograph The Who gig at Motorpoint arena Cardiff. When I look back at photos of Roger and Pete from the beginning it really makes me wish I was there. I was the only photographer at the gig however the camera crew took most of the photographic area with filming so was limited to what I normally could have done. More photos are on my web site. If you haven't seen Paloma Faith in concert this lady is amazing. Her personality lights up the room. From the first song her bond with her fans is so clear. The ways Paloma chats effortlessly inbetween numbers and makes you just love her more. Paloma gives every song she sings a piece of her soul when she is singing. A person you must see in concert. Press photo shoots have some great photo shoots over the next week. Sunday 30th September doing a sponsored walk with my son and hubby in aid of JDRF see previous blog. Then a made dash back to photograph a metal band on Sunday night at 11.30 pm for their debut album.